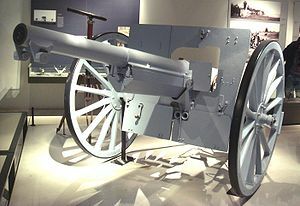 Canon de 75 Modèle 1897 on display in Les Invalides. Albert Deport, Etienne Sainte-Claire Deville and Emile Rimailho. The French 75 mm field gun was a quick-firing field artillery piece adopted in March 1898. Its official French designation was: Matériel de 75mm Mle 1897. It was commonly known as the French 75, simply the 75 and Soixante-Quinze (French for 75, literally Sixty-Fifteen). Initially, the French 75 had been designed as an anti-personnel weapon system for delivering large volumes of time-fused shrapnel shells on enemy troops advancing in the open. After 1915 and the onset of trench warfare, other types of battlefield missions demanding impact detonated high-explosive shells prevailed. By 1918 the 75s became the main agents of delivery for toxic gas shells . The 75s also became widely used as truck mounted anti-aircraft artillery. They were also the main armament of the Saint-Chamond tank in 1918. The French 75 is widely regarded as the first modern artillery piece. It was the first field gun to include a hydro-pneumatic recoil mechanism, which kept the gun's trail and wheels perfectly still during the firing sequence. Since it did not need to be re-aimed after each shot, the crew could fire as soon as the barrel returned to its resting position. In typical use, the French 75 could deliver fifteen rounds per minute on its target, either shrapnel or melinite high-explosive, up to about 5 miles (8,500 m) away. Its firing rate could even reach close to 30 rounds per minute, albeit only for a very short time and with a highly experienced crew. These were rates that contemporary bolt action rifles could not match. At the opening of World War I, in 1914, the French Army had about 4,000 of these field guns in service. By the end of the war about 12,000 had been produced. It was also in service with the American Expeditionary Forces (AEF), which had been supplied with about 2,000 French 75 field guns. Several thousand were still in use in the French Army at the opening of World War II, updated with new wheels and tires to allow towing by trucks rather than by horses. The French 75 set the pattern for almost all early-20th century field pieces, with guns of mostly 75 mm forming the basis of many field artillery units into the early stages of World War II. It is not to be confused with the Schneider-manufactured modele 1907 and "modele 1912" made for the French cavalry and the export market, and its 1914 modification. Although they used the original French 75's ammunition, these privately manufactured Schneider guns were lighter, smaller, and mechanically different. 1) Vieille's smokeless powder, which was introduced in 1884. 2) Self-contained ammunition, with the powder charge in a brass case which also held the shell. 3) An early hydro-pneumatic short recoil mechanism that was designed by Major Louis Baquet. 4) A rotating screw breech built under license from Thorsten Nordenfelt. The only major design difference between the 57 and 75 that would emerge was the recoil system. But even before the 57 entered testing, in 1890 General Mathieu, Director of Artillery at the Ministry of War, had been informed that Konrad Haussner, a German engineer working at the Ingolstadt arsenal, had patented an oil-and-compressed-air long-recoil system. They also learned that Krupp was considering introducing the system after testing it. Krupp would later reject Haussner's invention, due to insoluble technical problems caused by hydraulic fluid leakage. In 1891 Haussner sold his patents to a firm named Gruson, which searched for potential buyers. After reviewing the blueprints in February 1892, the French artillery engineers advised that a gun should be produced without purchasing the Haussner invention. Accordingly, General Mathieu turned to Lt. Colonel Albert Deport, at the time the Director of the Atelier de Construction de Puteaux (APX), and asked him whether he could construct a gun on the general principle of the Haussner long-cylinder recoil without infringing the existing patents. After it was judged possible, a formal request was sent out on 13 July 1892. It took five more years under the overall leadership of Mathieu's successor, General Deloye, to perfect and finally adopt in March 1898 an improved and final version of the Deport 75 mm long-recoil field gun. Various deceptions, some of them linked to the Dreyfus Case which erupted in 1894, had been implemented by Deloye and French counter-intelligence to distract German espionage. The final experimental version of Deport's 75 mm field gun was tested during the summer of 1894 and judged very promising. Extensive trials, however, revealed that it was still prone to hydraulic fluid leakage from the long-recoil mechanism. The Deport 75 was returned to Puteaux arsenal for further improvements. Hydraulic fluid leakage was typical of this experimental phase of artillery development during the 1890s, as Haussner and Krupp had previously experienced. In December 1894, Deport was passed over for promotion, and resigned to join "Chatillon-Commentry", a private armaments firm. Two young military engineers from Ecole Polytechnique, Captains Etienne Sainte-Claire Deville and Emile Rimailho, continued development and introduced an improved version in 1896. Their contribution was a leakproof hydro-pneumatic long-recoil mechanism which they named "Frein II" ( Brake # II ). A major improvement was the placement of improved silver-alloy rings on the freely moving piston which separated the compressed air and the hydraulic fluid inside the main hydro-pneumatic recoil cylinder. These and other modifications achieved the desired result: the long-term retention of hydraulic fluid and compressed air inside the recoil system, even under the worst field conditions. Captain Sainte-Claire Deville also designed important additional features, such as a device for piercing the fuzes of shrapnel shells automatically during the firing sequence (an "automatic fuze-setter"), thus selecting the desired bursting distance. The independent sight had also been perfected for easy field use by the crews, and a nickel-steel shield was added to protect the gunners. The armored caissons were designed to be tilted in order to present the shells horizontally to the crews. The wheel brakes could be swung under each wheel ("abattage"), and, together with the trail spade, they immobilized the gun during firing. The gun was officially adopted on 28 March 1898 under the name "Matériel de 75mm Mle 1897". The public saw it for the first time during the Bastille Day parade of 14 July 1899. Canon de 75 breech mechanism. The gun's barrel slid back on rollers, including a set at the muzzle, when the shot was fired. The barrel was attached near the breech to a piston rod extending into an oil-filled cylinder placed just underneath the gun. When the barrel recoiled, the piston was pulled back by the barrel's recoil and thus pushed the oil through a small orifice and into a second cylinder placed underneath. That second cylinder contained a freely floating piston which separated the surging oil from a confined volume of compressed air. During the barrel's recoil the floating piston was forced forward by the oil, compressing the air even further. This action absorbed the recoil progressively as the internal air pressure rose and, at the end of recoil, generated a strong but decreasing back pressure that returned the gun forward to its original position. The smoothness of this system had no equal in 1897, and for at least another ten years. Each recoil cycle on the French 75, including the return forward, lasted about two seconds, permitting a maximum attainable firing rate of about 30 rounds per minute. The French 75 fired two types of shells, both with a purposely high muzzle velocity of 500 metres per second (1,600 ft/s) and a maximum range of 6,900 metres (7,500 yd). The ballistic properties had been specifically designed for relatively flat trajectories extending to the designated targets. A 5.3 kilograms (12 lb) impact-detonated, thin-walled steel, high-explosive (HE) shell with a time-delay fuze. It was filled with picric acid, known in France as "Melinite", used since 1888. The delay lasted five hundredths of a second, designed to detonate the shell in the air and at a man's height after bouncing forward off the ground. These shells were particularly destructive to men's lungs when exploding in their proximity. A 7.24 kilograms (16.0 lb) time-fuzed shrapnel shell containing 290 lead balls. The balls shot forward when the fuze's timer reached zero, ideally bursting high above the ground and enemy troops. During 1914 and 1915, the shrapnel shell was the dominant type of ammunition found in the French 75 batteries. However by 1918, high-explosive shells had become the virtually sole type of 75mm ammunition remaining in service. Furthermore, several new shells and fuzes were introduced due to the demands of trench warfare. A boat-tailed shell (with a superior ballistic coefficient) which could reach 11,000 metres (12,000 yd) was also used during the latter part of the war. Every shell, whether it be a high-explosive or shrapnel shell, was fixed to a brass case which was automatically ejected when the breech was opened. The French 75 introduced a new concept in artillery technology: rapid firing without realigning the gun after each shot. Older artillery had to be resighted after each shot in order to stay on target, and thus fired no more than two aimed shots per minute. The French 75 easily delivered fifteen aimed rounds per minute and could fire even faster for short periods of time. This rate of fire, the gun's accuracy, and the lethality of the ammunition against personnel, made the French 75 superior to all other regimental field artillery at the time. When made ready for action, the first shot buried the trail spade and the two wheel anchors into the ground, following which all other shots were fired from a stable platform. Bringing down the wheel anchors tied to the braking system was called "abattage". The gun could not be elevated beyond eighteen degrees, unless the trail spade had been deeply dug into the ground; however, the 75 mm field gun was not designed for "plunging fire". The gun could be traversed laterally 3 degrees to the sides by sliding the trail on the wheel's axle. Progressive traversing together with small changes in elevation could be carried out while continuously firing, called "fauchage" or "sweeping fire". A 4-gun battery firing shrapnel could deliver 17,000 ball projectiles over an area 100 meters wide by 400 meters long in a single minute, with devastating results. Because of the gun's traversing ability, the longer the distance to the enemy concentration, the wider area that could be swept. Each Mle 1897 75 mm field gun battery (4 guns) was manned by highly trained crews of 170 men led by 4 officers recruited among graduates of engineering schools. Enlisted men from the countryside took care of the 6 horses that pulled each gun and its first limber. Another 6 horses pulled each additional limber and caisson which were assigned to each gun. A battery included 160 horses, most of them pulling ammunition as well as repair and supply caissons. The French artillery entered the war in August 1914 with more than 4,000 Mle 1897 75 mm field guns (1,000 batteries of 4 guns each). Over 17,500 Mle 1897 75 mm field guns were produced during World War I, over and above the 4,100 French 75s which were already deployed by the French Army in August 1914. All the essential parts, including the gun's barrel and the oleo-pneumatic recoil mechanisms were manufactured by French State arsenals: Puteaux, Bourges, Châtellerault and St Etienne. A truck-mounted anti-aircraft version of the French 75 was assembled by the automobile firm of De Dion-Bouton and adopted in 1913. The total production of 75 mm shells during World War I exceeded 200 million rounds, mostly by private industry. In order to increase shell production from 20,000 rounds per day to 100,000 in 1915, the government turned to civilian contractors, and, as a result, shell quality deteriorated. This led to an epidemic of burst barrels which afflicted 75 mm artillery during 1915. Colonel Sainte-Claire Deville corrected the problem, which was due to microfissures in the bases of the shells, due to shortcuts in manufacturing. Shell quality was restored by September 1915, but never to the full exacting standards of pre-war manufacture. The M.1897 75mm field gun was used as the main armament of the St Chamond tank, after the production of the 165th vehicle. The French 75 gave its best performances during the Battle of the Marne in August–September 1914 and at Verdun in 1916. At the time the contribution of 75 mm artillery to these military successes, and thus to the French victories that ensued, was seen as significant. In the case of Verdun, over 1,000 French 75s (250 batteries) were constantly in action, night and day, on the battlefield during a period of nearly nine months. The total consumption of 75 mm shells at Verdun during the period February 21 to September 30, 1916, is documented by the public record at the Service Historique de l'Armée de Terre to have been in excess of 16 million rounds, or nearly 70% of all shells fired by French artillery during that battle. The French 75 was a devastating anti-personnel weapon against waves of infantry attacking in the open, as at the Marne and Verdun. However its shells were comparatively light and lacked the power to obliterate trench works, concrete bunkers and deeply buried shelters. Thus, with time, the French 75 batteries became routinely used to cut corridors with high-explosive shells, across the belts of German barbed wire. After 1916, the 75 batteries became the carriers of choice to deliver toxic gas shells, including mustard gas and phosgene. The French Army had to wait until early 1917 to receive in numbers fast firing heavy artillery equipped with hydraulic recoil brakes (e.g. the 155 mm Schneider howitzer and the long-range Canon de 155mm GPF). In the meantime it had to do with a total of about four thousand de Bange 90 mm, 120 mm and 155 mm field and converted fortress guns, all without recoil brakes, that were effective but inferior in rate of fire to the more modern German heavy artillery. The excessive reliance on the 75 mm field gun, a doctrine developed by the General Staff during the pre-war years, cost hundreds of thousands of French lives that were lost during the unsuccessful Joffre offensives (Artois/Champagne) in 1915. Despite obsolescence brought on by new developments in artillery design, large numbers of 75s were still in use in 1939 (4,500 in the French army alone), and they eventually found their way into a number of unlikely places. A substantial number had been delivered to Poland in 1919–1920, together with infantry ordnance, in order to fight in the Polish-Soviet War. They were known as 75mm armata wz.1897. In 1939 the Polish army had 1,374 of these guns, making it by far the most numerous artillery piece in Polish service. Some French guns were modernized between the wars, in part to adapt them for anti-tank fire, resulting in the Canon de 75 Mle 1897/33 which fired a high-explosive anti-tank shell. Many were captured by Germany during the Fall of France in 1940, in addition to Polish guns captured in 1939. Over 600, renamed 7.5 cm Pak 97/38, were mounted on a 5 cm Pak 38 carriage and put to use by the Wehrmacht in 1942 as an emergency weapon against the Soviet Union's T-34 and KV tanks. Its relatively low velocity and a lack of updated armor-piercing ammunition limited its effectiveness as an anti-tank weapon. When the German 7.5 cm Pak 40 became available in sufficient numbers, most remaining Pak 97/38 pieces were returned to occupied France to reinforce the Atlantic Wall defenses. The remainder were used as second-line and coastal artillery pieces under the German designation 7.5 cm FK 231(f). In 1915 Britain acquired a number of "autocanon de 75 mm mle 1913" anti-aircraft guns, as a stopgap measure while it developed its own anti-aircraft alternatives. They were used in the defence of Britain, usually mounted on de Dion motor lorries using the French mounting which the British referred to as the "Breech Trunnion". Britain also purchased a number of the standard 75 mm guns and adapted them for AA use using a Coventry Ordnance Works mounting, the "Centre Trunnion". At the Armistice there were 29 guns in service in Britain. In June 1940, with many British field guns lost in the Battle of France, 895 M1897 field guns and a million rounds of ammunition were purchased from the US Army. For political purposes, the sale to the British Purchasing Commission was made through the US Steel Corporation. The basic, unmodified gun was known in British service as "Ordnance, QF, 75mm Mk 1", although many of the guns were issued to units on converted or updated mountings. They were operated by field artillery and anti-tank units. Some of the guns had their wheels and part of their carriages cut away so that they could be mounted on a pedestal called a "Mounting, 75mm Mk 1". These weapons were employed as light coastal artillery and were not declared obsolete until March 1945. During World War II, the British also received the American half-track M3 Gun Motor Carriage under Lend Lease terms and used these in Italy and Northern Europe until the end of the war as fire support vehicles in Armored Car Regiments. The US Army adopted the French 75 mm field gun during World War I and used it extensively in battle. The US designation of the basic weapon was 75-mm Gun M1897. There were 480 American 75 mm field gun batteries (over 1,900 guns) on the battlefields of France in November 1918. Manufacture of the French 75 by American industry began in the spring of 1918 and quickly built up to an accelerated pace. Carriages were built by Willys-Overland, the hydro-pneumatic recuperators by Singer Manufacturing and Rock Island Arsenal, the cannon itself by Symington-Anderson and Wisconsin Gun Company. American industry built 1,050 French 75s during World War I, but only 143 had been shipped to France by 11 November 1918; most American batteries used French-built 75s in action. The first US artillery shots in action in World War I were fired by Battery C, 6th Field Artillery on October 23, 1917 with a French 75 named "Bridget" which is preserved today at the United States Army Ordnance Museum. During his service with the American Expeditionary Force, Captain (and future U.S. President) Harry S. Truman commanded a battery of French 75s. During the 1930s most M1897A2 (French made) and M1897A4 (American made) guns were mounted on the modern carriage M2A3 which featured a split trail, rubber tires allowing towing at any speed, elevation limit increased to +45 degrees and traverse increased to 30 degrees left and right. Along with new ammunition, these features increased the effective range and allowed the gun to be used as an anti-tank gun, in which form it equipped the first Tank Destroyer battalions. These were later removed from their towed carriages and installed on the M3 Half-Track as the (M3 GMC) as these guns became surplus with their replacement by the more powerful and more versatile U.S. 105 mm M101 split-trail Howitzer by 1941. M3 GMCs were used in the Pacific theater during the Battle for the Philippines and by Marine Regimental Gun Companies until 1944. The M3 GMC also formed the equipment of the early American Tank Destroyer Battalions during operations in North Africa and Italy and continued in use with the British in Italy and in small numbers in Northern Europe until the end of the war. Many others were used for training until 1942. The 75mm M2 and M3 tank guns of the M3 and M4 Medium tanks, the 75mm M6 tank gun of the M24 light tank and the 75mm gun of the B-25 Mitchell bomber all used the same ammunition as the M1897. The 75mm Pack Howitzer M1 used the same projectiles fired from a smaller 75x272R case. A Canon de 75 modèle 1897 used as a Saluting gun, fielded in front of the Invalides and having fired the 21-gun salute in honour of François Hollande, recently inaugurated President of the French Republic. The Canon de 75 modèle 1897 is still used in France as a saluting gun. When the French Army discarded its 105 HM2 howitzers to replace them with MO-120-RT, only 155mm pieces remained, for which no blank cartridges were available. 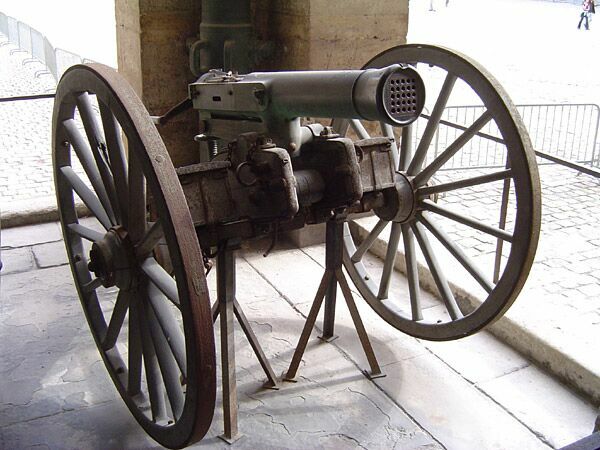 The Army then recommissioned two Canon de 75 modèle 1897, then located at the Musée de l'Artillerie de Draguignan. They are used for State ceremonies. Wikimedia Commons has media related to Canon de 75 modèle 1897 AA gun. self-propelled anti-aircraft variant, on De Dion-Bouton chassis. anti-aircraft variant on 1-axle trailer with stabilizer legs. ↑ Menne, Bernard (2007). Blood and Steel - the Rise of the House of Krupp. READ BOOKS. pp. 185. ISBN 1-4067-5533-8. ↑ Doise (1994). Un secret bien garde: Histoire militaire de 1'Affaire Dreyfus. Paris: Editions du Seuil. ISBN 2-02-021100-9. http://www.worldwar1.com/france/dreyfus.htm. ↑ Hogg & Thurston 1972, Page 48. ↑ 12.0 12.1 Crowell 1919. ↑ Investiture du Président : les coups de canons étaient... made in USA ! ↑ L’ARTILLERIE FRANÇAISE DE 1945 A 1990 (LES PIÈCES ET LEUR ENVIRONNEMENT), Lieutenant-colonel Jean-Paul PAILHES. Alvin, Colonel; André, Commandant (1923). Les Canons de la Victoire (Manuel d'Artillerie). Paris: Charles Lavauzelle & Cie.
Benoît, Lt-Col. Christian (1996). Le Canon de 75: Une gloire centenaire. Vincennes, France: Service Historique de l'Armée de Terre. ISBN 2-86323-102-2. Challeat, J. (1935). Histoire technique de l'artillerie en France pendant un siècle (1816–1919). Paris: Imprimerie Nationale. Crowell, Benedict (1919). America's Munitions, 1917–1918. Washington, D.C.: U.S.Government Printing Office. Doise, Jean (1994). Un secret bien gardé: Histoire militaire de l'Affaire Dreyfus. Editions du Seuil. ISBN 2-02-021100-9. Gudmundsson, Bruce I. (1993). On Artillery. Westport, Connecticut: Praeger. ISBN 978-0-275-94047-8. Hogg, Ian V. (1998). Allied Artillery of World War I. Crowood Press. ISBN 1-86126-104-7. Hogg, Ian V. (1972). British Artillery Weapons & Ammunition 1914-1918. London: Ian Allan. ISBN 0-7110-0381-5. Routledge, Brigadier N.W. (1994). History of the Royal Regiment of Artillery. Anti-aircraft artillery 1914-55.. London: Brassey's. ISBN 1-85753-099-3. Touzin, Pierre; Vauvillier, François (2006). Les Matériels de l'Armée Française: Les canons de la victoire, 1914-1918. Tome 1: L'Artillerie de Campagne. Paris: Histoire et Collections. ISBN 2-35250-022-2. Wikimedia Commons has media related to Canon de 75 modèle 1897.